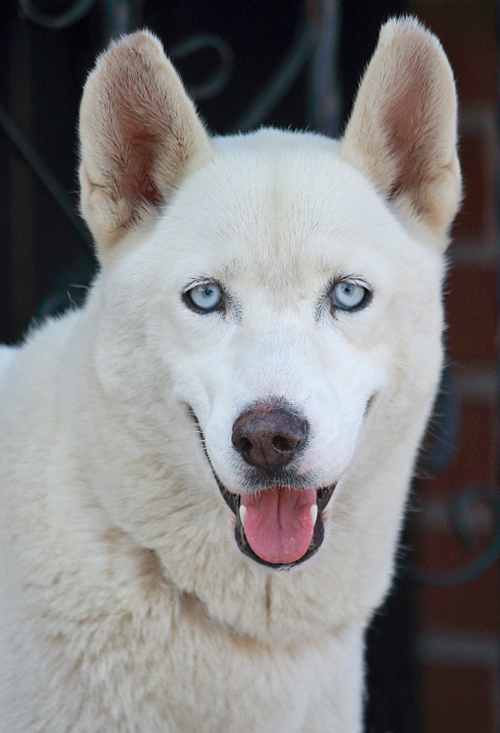 Alaska von Aurish is a truly beautiful 1-2 year-old white Husky female of medium size. Just give her a little time and wait for her to come to you, and she will show you what a sweet girl she can be. Alaska walks well on leash but comes out of her kennel a bit shy, so we let her adjust a little while she explores. She is initially a little apprehensive when meeting new dogs but, once she knows they are friendly, she becomes comfortable, starts wagging her tail and follows them. Alaska seems happier when being around dogs, so she does great in our doggie playgroups, and we think she would love a home with another dog. After a while, when she gets comfortable around the other dogs, she will start exploring the yard with a wagging tail. This girl’s confidence will grow in a loving home that provides her with love, leadership and positive reinforcement.